The major Roman fort complex was spotted on parched grassland near Brecon, Powys, and the marching camp near Caerwent in Monmouthshire. Aerial archaeologist Toby Driver said he could not believe his eyes when he spotted the fort fromthe air. Scores of Iron Age farms and forts were also found in Pembrokeshire and the Vale of Glamorgan. 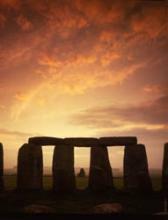 The crop of summer discoveries follow similarly exciting Bronze Age ones made during last winter’s snow. Dr Driver, from the Royal Commission on the Ancient and Historical Monuments of Wales (RCAHMW), said 2013’s spell of hot weather has left him reflecting on some of the most significant finds since 2006. He targeted reconnaissance flights in a light aircraft to where the drought conditions were most severe across the length and breadth of Wales. When crop marks show in drought conditions Dr Driver said the Royal Commission’s aerial survey only has a few weeks to record the sites before rain or harvest removes them. The Roman fort complex discovery near Brecon was a “rare discovery for Wales” and was made following a tip from Dr Jeffrey Davies, who he has been working with on another project – the Abermagwr Roman villa excavations near Aberystwyth. “Jeffrey Davies noticed an anomaly in Roman coin finds near Brecon, reported under the Portable Antiquities Scheme (PAS),” explained the aerial archaeologist. “He had a hunch that the coins, of the Emperor Claudius, could indicate a lost early Roman fort, and passed a grid reference to me the day before a flight into central Wales. Between Caerwent and Chepstow, the aerial survey pinpointed only the second Roman overnight marching camp in Monmouthshire which Dr Driver said appears to show a small expeditionary force on manoeuvres, perhaps in the years around 50 AD. “Because the campaigns against the tenacious Silures were documented by Roman historians, we expect more camps in south east Wales than we currently know about,” he added. 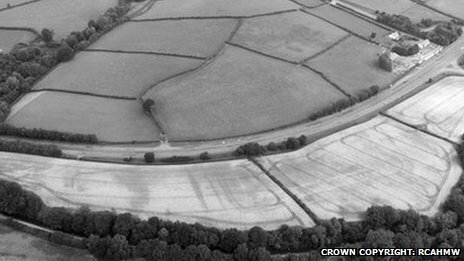 West of Caerwent, a “remarkable” Iron Age settlement was also revealed. In Pembrokeshire, one of the largest and most complex Iron Age defended farms in Pembrokeshire was found at Conkland Hill, Wiston, while in the Vale of Glamorgan more Iron Age settlements were discovered close to the Roman villa at Caermead, Llantwit Major. In the winter, surveys in the snow uncovered Bronze Age burial mounds in the Vale of Glamorgan and a moated site at Llangorse lake, near Brecon. The Royal Commission will now begin cataloguing and mapping the discoveries to make the information more widely available online.